So as you might have heard a new SimCity game came out resently, and things didn't go quite as planned. There were server problems abound resulting in most people being able to play the game, and the people who could play found a game full of bugs. Things have certainly calmed down since then, but they're still not perfect. As a way of apologizing for the issues EA has decided to let those who bought SimCity pick a free game out from a list of eight. 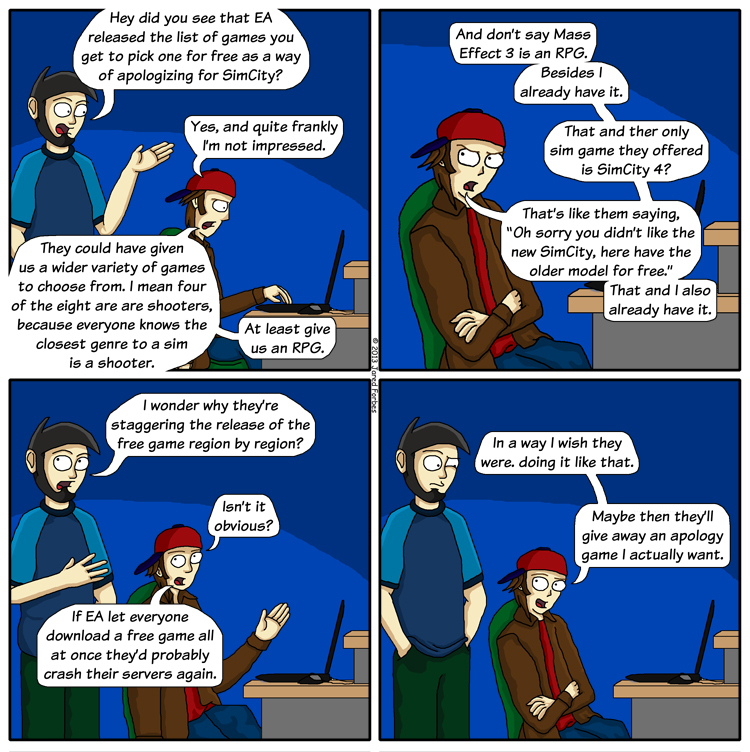 This is a nice gesture on EA's part, don't let the tone of the comic fool you. Truthfully I'm not all that mad at the choice of games, though I do find it odd that Sims 3 or one of it's many expansions aren't on the list, or any traditional RPG, you know a kind of game some one who bought SimCity might actually play? Really I don't care that EA is giving away a free game, truthfully instead of giving away a free game EA, instead do you think next time when you release a high profile game you release a game that actually works? I've siad in the past that in this internet connect world we live in, the ability to patch a game to fix an unforseen problem is awesome, however as time goes on you see more and more games being released in unfinished conditions, only to be patched into working order a few weeks to a few months later. As a gamer I would gladly wait a little longer for a game to be released, knowing that it was delayed to ensure I was getting the best product possible, instead of getting a broken game. Oh yeah and getting rid of always online DRM would be great too. 'Kay thanks bye.